Simley's Ben Rauschnot took a shot on goal during a recent game against Henry Sibley. He and teammate Brandon Reitberger have helped the team's success, fueled by more disciplined and team-oriented team play. 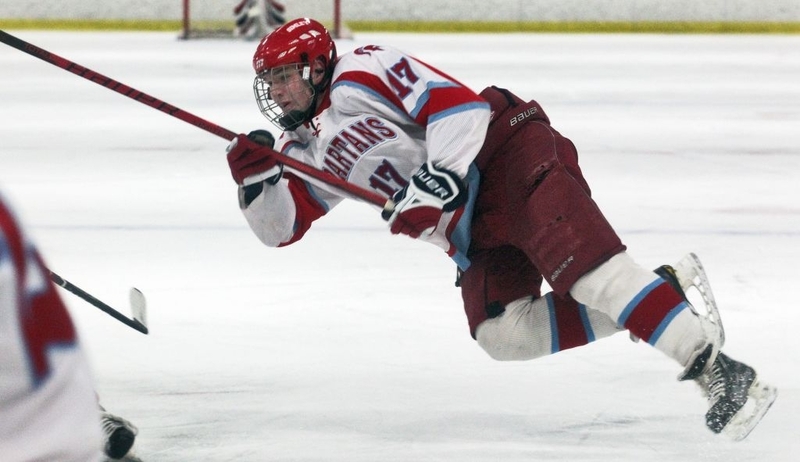 Simley boys' hockey has gone through its fair share of tough times. Statistically speaking, it couldn't get much worse. When Jim Joseph took the head coaching job four years ago, the Spartans accumulated just six wins in two seasons. "My first couple years here, we had some good kids here, don't get me wrong, but we also had issues to deal with," said Joseph, who previously coached high school hockey in River Falls, Wis. "It took a lot of the hockey away from it. We spent more time worrying about things that really aren't related to the game." Gradually, the culture began to change. The Spartans became more disciplined and team-oriented. Two core leaders -- Brandon Reitberger and Ben Rauschnot -- emerged from the youth program and started burying pucks. Their record seesawed. Last season, Simley inched close to .500 at 11-14-2. With Saturday's 4-1 victory at Farmington, the Spartans moved to 12-3 this year and surpassed last season's win total. It appears the worst of times are long behind this Inver Grove Heights school. "It's very refreshing to go into just about every game thinking you've got a chance. That wasn't the case three or four years ago," Joseph said. Reitberger tallied a hat trick against the Tigers. Rauschnot had a three-point night in Thursday's 4-3 victory over Henry Sibley. That's about par for the course for these teammates. "We talk a lot about what is a good player. I think a good player is the kind of kid who can make the guys around him better, and that's exactly what we've got with these two kids," Joseph said. Reitberger, a senior, has 32 goals and 14 assists for 46 points in just 15 games. As of Monday afternoon, he ranked fifth in the state in scoring. Reitberger is a speedster with plenty of skill on the puck. He has great hockey sense, including the ability without the puck to find open ice, where a linemate usually feeds him. "He can snipe it or bury it right around the net," said Rauschnot, a junior. "He's good in a lot of areas." Rauschnot is the playmaker, with 14 goals and 27 assists for 41 points. "He's also got a pretty good shot, too," Reitberger said. "And he's gotten so much faster." Because they're a year apart in age, the Simley duo played together every other year since peewees. Joseph stuck them on a line together last year -- Rauschnot's first of varsity hockey, Reitberger's second -- and it naturally clicked. "We just seem to have a knack for where each other is going to be," Rauschnot added. The goals and, more importantly, victories have generated excitement in the Simley community. Joseph, who works closely with the youth hockey program, said he can feel everything coming together. One obstacle Simley faces, as a smaller metro program, is losing players to open enrollment to surrounding hockey programs. Joseph said that trend has been curbed. "I don't think you'll stop it completely, but we've certainly slowed that and we feel good about the direction we're heading and we feel really good about the relationship we have with the youth hockey program," Joseph said. The rink feels different, too. "People are actually coming out to see us now," Rauschnot said. "We have a better morale on the bench. Practices are more exciting. It's just an overall better atmosphere."